It’s a bowl, it’s a loaf of bread, it’s an entire meal; whatever it is, it’s a great excuse to get together with friends. 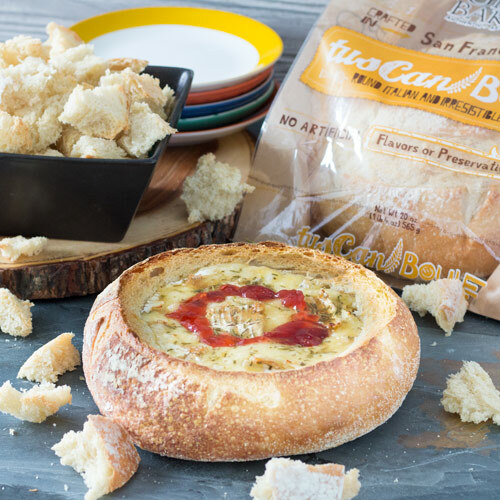 Our Baked Brie Boule brings together three of your favorite food groups, delicious, tasty, & outstanding. People rarely get their daily serving, so don’t skimp on the Brie, go big on the Tuscan Boule, and swirl away with as much jam as required. We don’t normally encourage mistreating our bread, but in the case of this mouthwatering little party-gem we’ll make an exception. After all our bread has a mission: to put a smile on as many faces as possible, and to disappear in a single sitting. Preheat oven to 450ºF. Cut the top off the boule. Dig out the bread inside making sure to leave a 1-inch wall around the sides and bottom. Tear the removed bread into bite-size pieces and arrange pieces and empty boule on a baking sheet. Drizzle with olive oil and toast until lightly browned (approximately 10 minutes). Remove from oven. Transfer toasted croutons to a bowl but leave boule on baking sheet. Cut one large piece of Brie to fit into the boule and use smaller pieces of Brie to fill in the gaps around the edges. Top Brie with brown sugar, wine and rosemary. Bake uncovered until cheese is slightly melted (approximately 10 minutes). Add a swirl of raspberry jam on top of the cheese. Cover boule loosely with foil, and bake for an additional 5 minutes. Serve hot with toasted croutons on the side for dipping.